Eau Moheli is this summer's entry from French niche line Diptyque; it joins Eau Rose in their Les Florales collection. The name comes from Mohéli, one of the three Comores islands, and it's "about" ylang ylang, or as Diptyque puts it, Eau Moheli "approaches the scent of this exotic flower from another point of view, capturing the journey from its remote island home in the Indian Ocean". 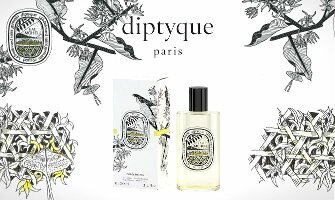 If you've kept up with Diptyque's recent releases, from 2005's Do Son on through to last year's Volutes,1 you were presumably already prepared not to expect anything heady, much less a traditional exotic floral, and in that sense, Moheli delivers: after a brief punch of ylang ylang and citrus and fruit and peppery ginger in the opening, it calms into something closer to the house's modern sheer style, and into something that you might not immediately think of as primarily a ylang ylang perfume at all. The dry down does stay floral — a man could wear it, but it's closer to Eau Rose than Volutes; some men might find Eau Moheli too far into floral territory to be a comfortable wear. The base notes (patchouli, vetiver, benzoin, tonka bean and incense) are kept mostly pale and quiet, and after the first twenty minutes, it's quiet enough to qualify as office-friendly. It is lightly sweet, and the later stages have a nice warmth, almost like sun-warmed skin, and just enough spice to keep things interesting. Verdict: Mixed. I've complained, several times over, about the lack of heft and personality in Diptyque's modern fragrances; really, Volutes is the only post-2005 fragrance that made my buy list. I like Eau Moheli better than most of the others, and I'd wear it happily if I had some, but I don't adore it so much that I'm dying to own it, and my absolute favorite part was the whoosh of the opening. Perhaps more tellingly, I was less interested in it every time I wore it. Know a great ylang ylang fragrance? Do comment! And check out Erin's list of 5 great ylang ylang perfumes. 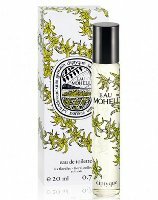 Diptyque Eau Moheli was developed by perfumer Olivier Pescheux; it is available in 100 ml Eau de Toilette and 20 ml roll on. I do miss the old style bottles, but the design on the smaller roll on is particularly lovely. 1. I'm not including this year's L’Eau du Trente-Quatre since it was really just a variation on the older 34 Boulevard Saint Germain. Sounds like another fresh option for the summer. A light sunny fragrance is always welcome for the summer But I’ve got a feeling it doesn’t wear long on the skin? You know, it’s not as light as all that — I thought the lasting power was pretty reasonable. I liked the opening of this one too, but I’m less sure about it after an hour or so–it seems to turn sort of bitter on me. That seems to be my pattern with Diptyque lately. I loved the opening of Eau Duelle, but after a while an annoying musk took over and just swallowed up everything else. I will try this one again, though. Ah, interesting. That’s too bad. Oh, me too! On first sniff I was pretty enthused, but as it wore, it turned sour, actually started to smell unpleasant. Interesting that I’m not the only one. I’m definitely giving in a try when I can. It sounds nice but one never knows without sampling, right? If I spot it around or someone will be offering a sample for a swap I will definitely take care of getting it. I liked Volutes and I liked the L’Eau du 34 as well. In terms of ylang-ylang I like the way it smells in Miller et Bertaux #1 Parfum Trouve. I’m also curious to try Le Labo Ylang 49. Le Labo Ylang is quite different than this — really much more like a darkish chypre. I’m curious about both Ylang and Lys, are they worth trying? I like Lys better, but they’re both worth trying, yes. I like them better than some of the earlier women’s florals they did. Should have added….Angie will review the Ylang next week, and I’ll do the Lys next week or the week after. Great, thanks! I’ll wait to read your and Angela’s impressions before ordering them. Lucasai, I have a small sample of this I am bringing in the little set for you when I come to Poland in July! It smells like a nice combination to me of flowers + cinnamon. I know it doesn’t have cinnamon so somehow the pepper/ginger combination is reading to me that way. I kind of like it actually, but am not sure I’ll buy it. Also I am going to go to Saks here someday soon and see if they’ll give me some Le Labo samples. I think I mentioned it before but Diptyque sent me a sample together with an invitation to a launch party plus some cute postcards and, in all honestly, I found the cards more exciting than the perfume (they make great bookmarks). I, too, thought that the opening was the most interesting part but I found the rest completely nondescript. For ylang ylang I quite liked MH La Pluie. LOL — not a good sign, making good bookmarks. I am sure they are finding an audience for this style though, even if it isn’t you & I.
I, too, am disappointed by the recent Diptyque offerings. Lombre dans L’Eau was one of my very first niche scents and I proudly own a bottle. Nothing else so far has made me reach for my wallet ( well, I thought about it when the EDP version of Philosykos came out. For Ylang-Ylang, I enjoyed my sample of M. Micallef Ylang in Gold and it’s lingering on my “get more of this” list. I thought it was so pretty. I love the old Diptyques like L’Ombre & Philosykos…wish they’d mix things up more & try different styles. Thanks for the review: I’m glad you killed a potential lemming -though of course I will try Eau Moheli when I spot it. It seems the doctor prescribed me to try every white floral fragrance on the market!!! I have many Ylang loaded favorites (though not necessarily Ylang centerd! ): Amaranthine, Lys soleia (I swear it has loads of ylang!!) and Songes. I think it’s the yalng that makes them slightly thick, and buttery, and banana-ish, and sensual. Now I got a craving for those three!!! too bad I’m already out and about… Nothing beats smelling thick, and buttery, and banana-ish!!!! The banana-ish aspect is very light here, not at all buttery, and certainly not thick. Will be curious to hear what you think of it. I rather like this, it’s very pretty and sort of invokes sea breezes on a tropical island for me (not that I’ve frequented any to know!) It reminded me of Sous le Vent without that slightly harsh/bitter note (though I see that others notice a bitterness in this too). The Diptyque SA who showed it to me is from one of the Polynesian islands and became a little emotional as she sniffed it, saying it did remind her of home. At the other end of the scale I like Micallef’s Ylang in Gold, Carla Fracci’s Giselle and the ylang ylang note in the Vanilla Hermessence (can’t remember its name). Great review although this sounds like a miss for me. I’m old (and cranky) so I don’t do “modern and sheer”; I prefer classic, elegant and rich. I really enjoy the ylang ylang frangipani combination (along with a little jasmine and tuberose) in Guerlain’s Mahora. Yes! Mahora! That was what I was going to respond too. My favorite tropical “hot mess”. It is not rich, that is for sure — can’t touch Mahora. Hi Robin. Thanks for the review. I’ll really have to look at Erin’s list — I love ylang and don’t find it banana-like at all. I’m still looking forward to this even if it isn’t a heady, ylang ylang explosion. I actually have liked and bought many of Diptyque’s launches in recent years — especially several of the Eaux. I would buy a mini of Eau Rose as well. Notably, I was pretty unmoved by Volutes! Even when they’re seemingly light and airy, I get decent longevity and a good amount of “waft” from the scents. Also, note that the style of this bottle is totally in line with the bottles that have been used for the Eaux since the beginning (Tarocco, Hesperides, etc.). The core line has different bottles. I wish the price per ml for the 20ml roll ons were just a wee bit more economical. As for ylang scents, I have to say that I was *floored* to discover how much I liked Demeter’s Ylang Ylang massage/body oil when I bought a bottle a couple months back. Linear and not complex, but really delicious. Not sure how it translates in the spray version. Joe, we are nearly opposites when it comes to Diptyque, no? Except I do like the Eaux too, especially the Eau of Eau or whatever it was called. And hey, good to know. There are some real gems over at Demeter. I don’t know how I missed an entire line at Barneys…but lo and behold, the Diptyque line is at Barneys (midtown NYC). There is a massive renovation going on down at the beauty and fragrance floor; where the Le Labo used to be is now all closed off and the line was relocated to the edge of the fragrance counter, tucked away. The Diptyques – including the big fat candles, were prominently displayed along the wall blocking the area being renovated. Anyway, I went straight for Moheli and all I can say is that it was just meh…kind of very thin and anemic…the citrus was flat and the floral could be any hybrid mix of anyflower. Yes, it is like anyflower by the middle. Shame. I LOVED the first thirty minutes of Eau Moheli — I literally couldn’t keep my wrist away from my nose. So delicious! I was thinking of buying a bottle right then and there. I was glad I waited because after half an hour, it fizzled away to a thin, sweetish nothing. So disappointing! I guess I could just keep spraying.